AUSTIN (Texas) MARCH 13, 2018 – ArtPrize, the independently organized art competition recognized as the world’s largest annual public art event, in collaboration with SXSW, last night awarded a $15,000 grant to Gustavo Prado for his installation of concave and convex mirrors. Prado captured the attention of tonight’s five judges, earning the opportunity to realize their vision on Vandenberg (Calder) Plaza in the heart of the ArtPrize district for the competition’s tenth iteration. ArtPrize is slated to return to Grand Rapids, Michigan from September 19-October 7, 2018. Prado’s work was selected from among five artists who presented their ideas for ambitious installation ideas at tonight’s ‘$15k ArtPrize Artist Challenge at SXSW’ event. Each artist had five minutes to capture the hearts and minds of a panel of arts professionals including: Veronica Roberts, Curator of Modern and Contemporary Art at The Blanton Museum of Art at The University of Texas at Austin; Cezanne Charles, Director of Creative Industries for Creative Many Michigan; Jamie Bennett, Executive Director of ArtPlace America; Kim Cook, Director of Art & Civic Engagement at Burning Man; and Kevin Buist, Exhibitions Director for ArtPrize. 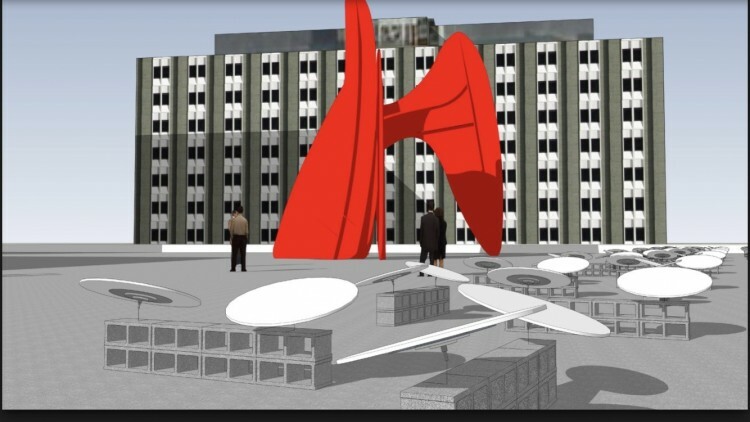 Prado’s installation inverted the traditional challenge artists face in VandenBerg (Calder) Plaza. Instead of creating a work that competes on presence with La Grande Vitesse, the work reflects and amplifies the landscape it occupies. 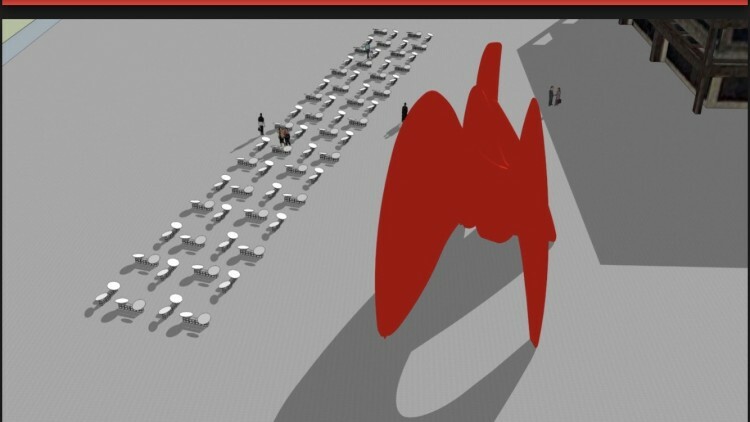 The series of convex mirrors will be installed in a stream formation, reflecting not only Calder’s sculpture, but also referencing Grand Rapid’s namesake river. This official SXSW Interactive event was modeled on the successful ArtPrize Pitch Night event series, launched in 2013 as a means of discovering and supporting exciting projects, and to reduce the barriers to bringing them to the annual competition. It is part of a suite of ArtPrize granting programs that in 2017 awarded nearly $300,000 to artists, venues and educators to support their participation in the annual event. Since its inception, the Pitch Night program has continued to expand and in 2018 includes events in five cities across the country starting in May. Each event will award the winning artist $5,000 and a spot in a prominent ArtPrize venue during the tenth annual event. ArtPrize 10 will take place across downtown Grand Rapids, Michigan from September 19-October 7, 2018. Venue registration for the world’s largest art competition is now underway, and Artist registration will kick off on April 16.